Biking in New York has turned into a common means of travel since the addition of biking lanes and citi-bikes. Generally speaking, all vehicles follow the same road rules with minor differences. If you are biking in New York it is important to know what rules to follow to avoid bicycle accidents. 1) If you are riding a bicycle on the roadways with other motor vehicles in the state of New York you must ride with the traffic. This is because operating a bicycle against the flow of traffic has been shown in significantly increase the rate of bicycle accidents. 2) When a bicycle lane is present on the roadway, a bicyclist is required to use it. However, when a separate pathway is available adjacent to the roadway the bicyclist has a choice to either use the path of the roadway. 3) When turning on a roadway a bicyclist must signal just as motor vehicle drivers have a duty to signal. 4) Bicyclists have a duty to obey traffic lights and signs just as every other driver on the road has a duty to obey these lights and signs. 5) Anyone under the age of 14 biking in New York while on the roadway must wear a helmet. If a bicyclist under the age of 14 is caught not wearing a helmet, his or her parent of guardian may be subject to a fine for allowing the minor to violate this particular law. 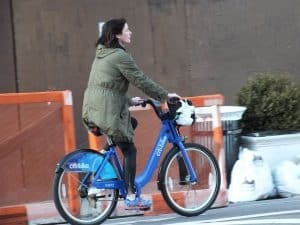 It is important to note that this rule is specific for biking in New York; some counties and municipalities require that everyone traveling on a bicycle must wear a safety helmet while traveling on a bicycle within the county’s lines. 6) Although bicycles are permitted on highways they are not permitted on interstate highways or expressways. 7) Bicyclists may ride side-by-side on roadways; however, when other vehicles are attempting to pass them they must travel single file. 8) Similar to the laws for motorcycle traveling on the roadway, while biking in New York and listening to a portable music device you may only wear one earphone. 9) While biking in New York you must be equipped with the following: an effective brake, a bell or horn audible for 100 feet away, a head light and taillight if ridden at night, and reflectors on the wheels if ridden at night. 10) Pedestrians have the right of way with regard to bicyclists similar to pedestrians’ rights of way with other motorists. 11) It is unlawful for a bicyclist to carry more people on the bicycle than the bicycle is designed to carry. 12) It is illegal for a bicyclist to grab on to, or attempt to attach himself to another vehicle on the roadway. 13) If a bicycle accident occurs which involves a death or serious injury, it must be reported to the Department of Motor Vehicles within ten days of the accident. 14) If a bicyclist causes serious injury to another in the course of operating his or her bicycle, he or she has the duty to stop, provide contact information, and notify the police as soon as possible. It is a crime for a bicyclist to leave the scene of an accident where he or she caused injury with taking the aforementioned steps just as it is illegal for the operator of a motor vehicle to leave the scene of an accident without taking these steps. 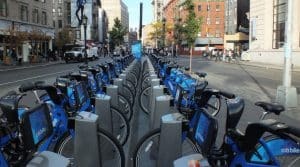 If you were in an accident while biking in New York you should contact a personal injury attorney to understand all of the biking laws in New York and know who is at fault. You deserve to seek justice for your damages and the team at Pulvers, Pulvers & Thompson will fight for you. Receive a free New York personal injury consultation today. Next StoryIs My Personal Injury Settlement Taxable?